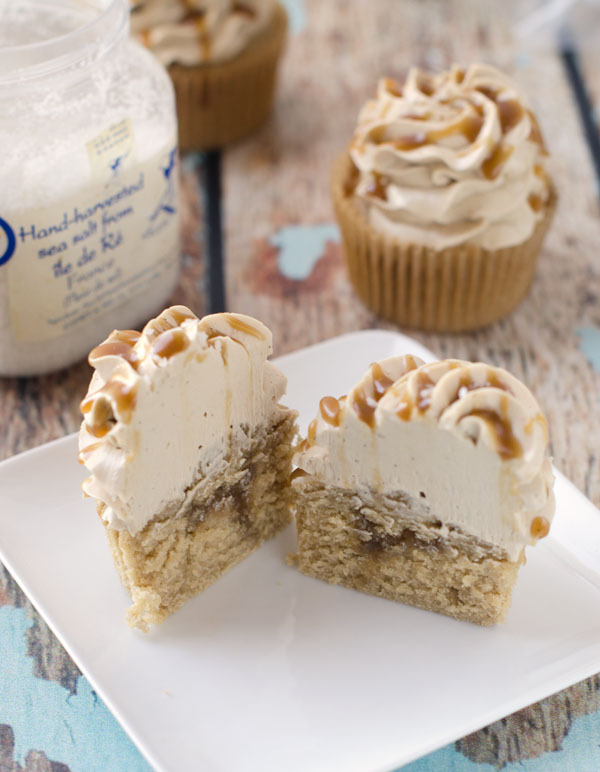 If you are a fan of butterscotch, then you will LOVE these cupcakes from Cake Merchant. Why? Because there is butterscotch filling inside the butterscotch flavored cake AND butterscotch flavor in the Swiss meringue buttercream frosting. Oh, and I almost forgot to mention to bourbon flavor. So there ya go – all the butterscotch a person could possibly ask for in one little package. Preheat the oven to 350 degrees fahrenheit and line a muffin tin with 12 paper liners. In a measuring cup, whisk together the milk, egg, egg white, vanilla, bourbon, and butterscotch flavor. In a large bowl or the bowl of a stand mixer, whisk together the flour, cornstarch, baking powder, salt, and dark brown sugar. With the mixer on low, add the butter one piece at a time until the mixture looks like moist crumbs. Add all but 1/3 of the milk mixture and beat on medium speed for about 60 seconds. Add the remainder of the milk mixture and beat on medium for an additional 30 seconds. Scrape down the sides of the bowl with a spatula and beat for 20 more seconds. Divide the cupcakes between the 12 paper liners and bake for 15-18 minutes, until a toothpick inserted into the center comes out clean. Combine the egg whites, brown sugar, and salt in a bowl (I used the bowl of my stand mixer). Heat the egg white mixture until it reaches 160 degrees fahrenheit if using fresh eggs (use the finger method if using liquid egg whites), whisking frequently so as not to get scrambled eggs. Whip the egg whites until they become fluffy and double in volume. The bowl should be neutral to the touch (this will usually take several minutes). Once the buttercream has become smooth, and the butterscotch sauce and beat until incorporated. 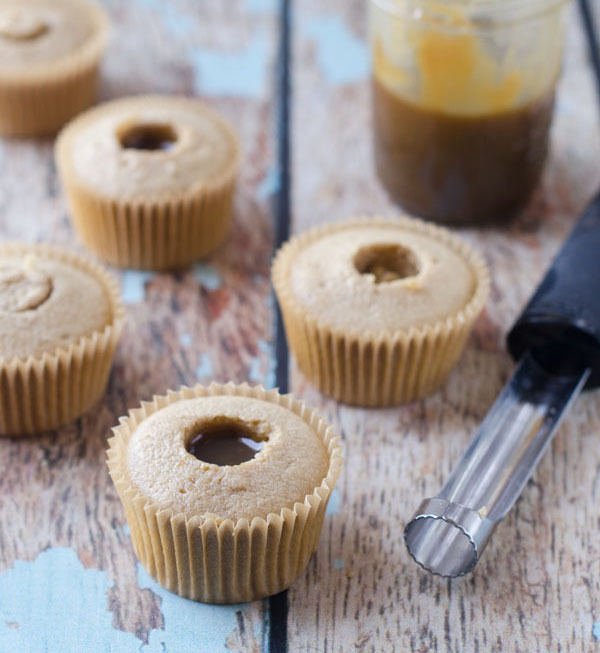 Use an apple corer to make a hole on the center of the cupcakes and scoop out the middle (leave enough on the bottom so the sauce will not spill out). Fill each hole with butterscotch sauce and place the scooped out portion back on top. Using a piping tip, pipe the frosting on the cupcakes. Drizzle with the remainder of the butterscotch sauce and top with a few flakes of fleur de sel. Melt butter in a medium heavy-bottomed saucepan over medium heat. Add the sugar, cream and salt and whisk until well blended. [fusion_builder_container hundred_percent=”yes” overflow=”visible”][fusion_builder_row][fusion_builder_column type=”1_1″ background_position=”left top” background_color=”” border_size=”” border_color=”” border_style=”solid” spacing=”yes” background_image=”” background_repeat=”no-repeat” padding=”” margin_top=”0px” margin_bottom=”0px” class=”” id=”” animation_type=”” animation_speed=”0.3″ animation_direction=”left” hide_on_mobile=”no” center_content=”no” min_height=”none”][A flat whisk works great here.] Bring to a very gentle boil and cook for about five minutes, whisking occasionally. Remove from heat and add one teaspoon of the vanilla extract, stirring to combine and this is where, despite the simplicity of the recipe, you get to feel all “chef-y”. Dip a spoon in the sauce and carefully taste the sauce (without burning your tongue!) to see if you want to add additional pinches or salt or splashes of vanilla. Tweak it to your taste, whisking well after each addition. I ended up using a full teaspoon of flaky salt and the listed amount of vanilla to get a butterscotch sauce with a very loud, impressive butterscotch flavor but the strength of your vanilla and intensity of your salt may vary.